I welcome today with open arms after yesterday’s tragedy in Connecticut. I was in a real funk after hearing about the shooting (rightfully so) and couldn’t quite snap out of it all day. Even though we had our holiday party at work and I got to come home to my hubby and my puppy, I couldn’t shake the terrible sadness I was feeling. I can’t even imagine what that town is going through right now and my thoughts are with them in this unthinkably difficult time. I am so thankful to get to see my little brother today and my sister and my parents… they are all getting extra big hugs from me for sure. Today is a new day and will most certainly be a better day, so with that said, onto a few happier things. Today is my best friend’s birthday! Dana and I have been friends forever. Seriously. We were next-door neighbors when we were born and have been friends ever since. Sure, we were forced to be friends. But years of our parents making us play nice turned into a fantastic friendship that I know I’ll have as long as I live. Weren’t we cute? I’m on the left and Dana is on the right. And that’s my momma 🙂 She’s so pretty. And here we are today… Dana is on the left this time and has a lot more hair, but we are more or less the same. Love you, Dana! Happy birthday. And now onto the craft! 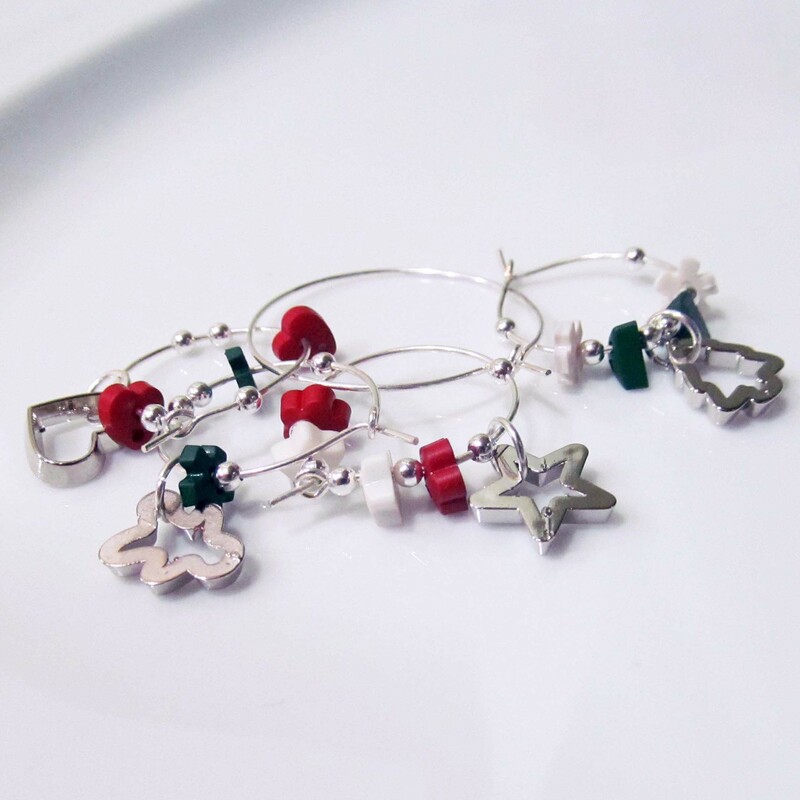 I’ve already shown you how to make wine charms, but did you ever think to make holiday-themed wine charms as inexpensive Christmas gifts? I hadn’t until this year, but as I was wandering the aisles of Michaels I Stumbled across holiday buttons and picked up a pack of holiday lights and cookie cutter buttons. Holy cuteness. The first set I made were a Secret Santa gift for my coworker Julie. I made her a set of three wine cork ornaments and these wine charms to go with a nice bottle of wine. 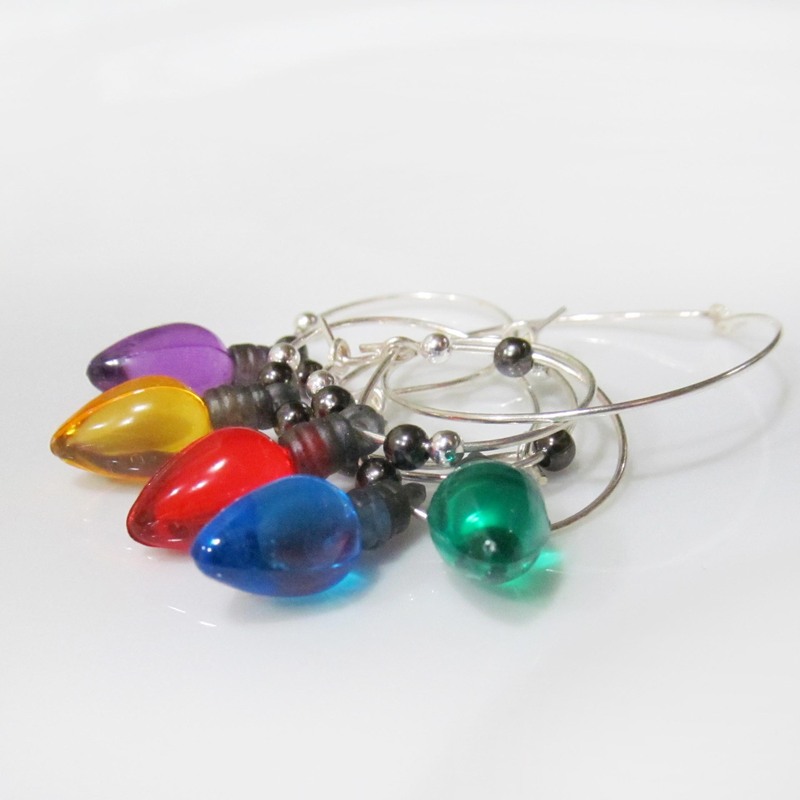 I used the Christmas light buttons and a few silver beads as accents to make this adorable set of wine charms. She really liked them and said she didn’t have any wine charms at all before! Sweet. Then I made this set of cookie cutter charms. The colors are all very similar, but each charm is very different: Heart, tree, gingerbread man, star. I have two sets of these and will be giving them out as Christmas gifts. Gah, they are so cute. All in all, these probably cost about $2 per set. So if you need an inexpensive gift, these are a great idea.